Overwhelmed by climate information? 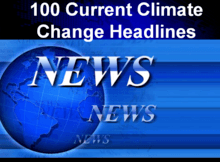 Check out 100 Climate Headlines at any time to see what climate-relevant topics have been in the news and to find some of the most interesting coverage of those topics. Stories will display right there for easy access and review. News items are always being removed and added to keep the selection fresh.